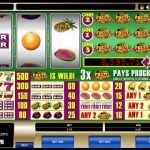 Fruit Fiesta 3 Reel is a progressive video slot game from Microgaming. This is a classic slot with traditional fruity symbols but with a twist, a big mouth watering prize. If you have played a pub fruit machine slot this game might remind you of those times. The game is very easy to play, even for first time players since there are no overcomplicated features, just straightforward spinning of the reels. There is only one special symbol in Fruit Fiesta 3 Reel video slot game but it is so valuable. First things first, it substitutes for all the other symbols, since there is no scatter here, to complete a winning combination. This symbol is also the key to the big prize we are all in for it, the progressive jackpot. You need to land 3 wild symbols on the 3rd pay line to be the big winner. There is only one catch here, you need to place maximum bets to be eligible to win the prize. This compensate for lack of free spins or other bonus mini games. Fruit Fiesta 3 Reel is a really nice game and Microgaming has outdone itself when it created this game. The main reason we are saying that is because this is an old slot that passed the test of time. Old players love this slot, and the game itself attracts new punters as well. The jackpot is not that big as in Mega Moolah for instance, but 5 figures are still good enough and worth the effort we must say. If you have not tried this slot before this is your chance and let us know if you hit the jackpot. Do you like progressive jackpots? you should consider playing CashSplash 5 Reel a 5 reel slot by MicroGaming.